The Spazmatics story… (How The Spazmatics became The Spazmatics) The Spazmatics were born in the spring of 1983 when physics professor Kevin Stigwood of Alta Dena High in Thousand Oaks California, lost a debate over String Theory to an upstart pupil in front of the entire student body and faculty. As agreed to by both parties, the loser would have to do anything that the winner demanded, and the victorious prodigy demanded that Mr. Stigwood perform “She Blinded Me With Science” by Thomas Dolby during half-time at an upcoming state basketball championship game. 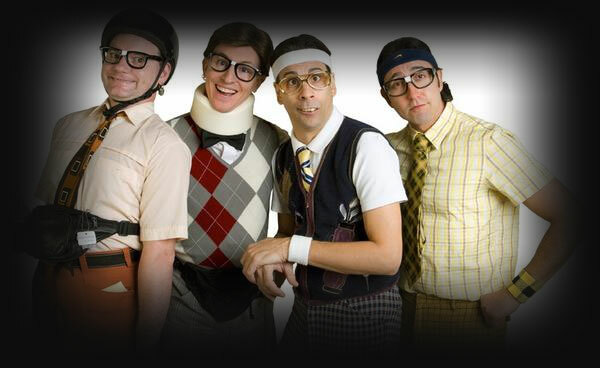 You can book The Spazmatics for your next event just by clicking the "Book Them Now" button to the right and filling out the form. We will be in contact with you about their availability as soon as possible.